The number of leaks of classified information reported as potential crimes by federal agencies reached record high levels during the first two years of the Trump Administration, according to data released by the Justice Department last week. 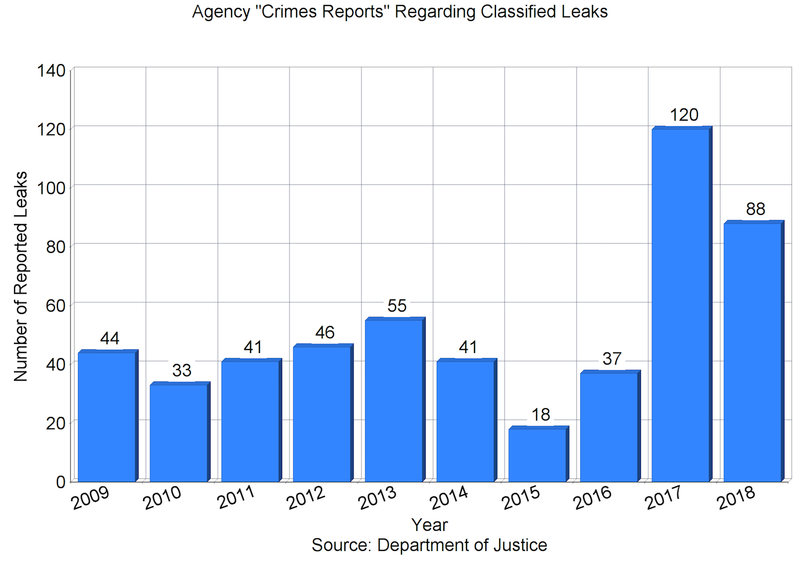 Agencies transmitted 120 leak referrals to the Justice Department in 2017, and 88 leak referrals in 2018, for an average of 104 per year. By comparison, the average number of leak referrals during the Obama Administration (2009–2016) was 39 per year. There are a “staggering number of leaks,” then-Attorney General Jeff Sessions said at an August 4, 2017 briefing about efforts to prevent the unauthorized disclosures. “Referrals for investigations of classified leaks to the Department of Justice from our intelligence agencies have exploded,” AG Sessions said at that time. He outlined several steps that the Administration would take to combat leaks of classified information, including tripling the number of active leak investigations by the FBI. Not all leaks of classified information generate such criminal referrals. Disclosures that are inadvertent, insignificant, or officially authorized would not be reported to the Justice Department as suspected crimes. Meanwhile, only a fraction of the classified leaks that are reported by agencies ever result in an investigation, and only a portion of those lead to identification of a suspect and even fewer to a prosecution. The newly released aggregate data on classified leak referrals serve as a reminder that leaks of classified information are a “normal,” predictable occurrence. There is not a single year in the past decade and a half for which data are available when there were no such criminal referrals. But the data as released leave several questions unanswered. They do not reveal how many of the referrals actually triggered an FBI investigation. They do not indicate whether the leaks are evenly distributed across the national security bureaucracy or concentrated in one or more “problem” agencies (or congressional committees). And they do not distinguish between leaks that simply “hurt our country,” as the Attorney General put it, and those that are complicated by a significant public interest in the information that was disclosed. A glimpse of the new operations was provided in the latest quarterly report on the U.S. anti-ISIS campaign from the Inspectors General of the Department of Defense, Department of State, and US Agency for International Development. The three classified programs are known as Operation Yukon Journey, the Northwest Africa Counterterrorism overseas contingency operation, and the East Africa Counterterrorism overseas contingency operation. Detailed oversight of these programs is effectively led by the DoD Office of Inspector General rather than by Congress. “To report on these new contingency operations, the DoD OIG submitted a list of questions to the DoD about topics related to the operations, including the objectives of the operations, the metrics used to measure progress, the costs of the operations, the number of U.S. personnel involved, and the reason why the operations were declared overseas contingency operations,” the joint IG report said. DoD provided classified responses to some of the questions, which were provided to Congress. Overseas contingency operations are funded as “emergency” operations that are not subject to normal procedural requirements or budget limitations. “We will continue to seek answers to these questions,” the IG report said.